First, yes I saw that you acknowledged the winning thing, didn't want to sound like I didn't see it. i still belive my recommendation is a viable option and I would have a Plan with it. Second, sorry again, with heavy I didn't mean it in military terms, but more in " a lot of infantry". Fusiliers could be a realy good core. I totaly agree. Well as we don't have the map we all just guess how the terrain is from the 3 screenshots we have. My Impression is, that a forward defence is not suitabel because I think Bill will have a good base of Fire on all key locations in that area. But you are probably much better in reading terrain than I am. I must say, I'm more excited for this AAR than any other one I've witnessed in the past. Definitively pulling for the Germans here. 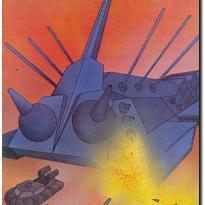 Yes, but which of his forces will be able to counterattack and capture Bil's base? My Impression is, that a forward defence is not suitbal because I think Bill will have a good base of Fire on all key locations in that area. The Germans will need to stay back from the southern edges of the village and forest for sure, but there is enough depth there to defend the interior. I do wonder if the 3 objective are all worth equal victory points. If they are then the northernmost one will probably be irrelevant except in influencing degree of victory/defeat. * Unless Elvis buys some fortifications. Yes, it feels to me like this map is significantly larger than it has to be. I suspect most if the fighting will take place in the southernmost third of the map. Everything north of that big BUA appears to be inconsequential. If Elvis holds Bil off in the south, that other objective isn't going to matter much. Likewise, is Bil smashes Elvis in the south, Elvis likely won't be able to prevent him from strolling up there and grabbing the northern town. Well Bill gave us Grid, and if I counted correctly, the map is 2000m x 1000m. That is pretty large imho. Is there another thread where we can talk openly about tactics? I'm not sure what I can/should write here. And I think we slowly get pretty detailed about combat plans. Pity the V1 is not yet available. Could be a game changer. I would call that "medium"
Besides, there is a difference between being physically large and playing large. I agree with lurrp that the contest will be determined along a fairly small strip of territory. Yeah, I've wondered about that too. The only reason I'm saying any of this stuff here is because Bil hasn't said anything about his plans so it's still speculation. I can't agree with most of the recommendations I'm seeing, at least if you're trying to win (which I understand is not necessarily the goal). Looking at that map... the more infantry the better, preferably a type with short range firepower. Panthers and Stukas are extravagances you can't afford. Anti-tank mines only have to disable one tank to earn back your investment and the psychological effect alone is almost worth it. I don't know how the point values break down, but I think Vanir is exactly right in recommending two companies of infantry as the core of the force. They will give a lot more survivability and flexibility to a a smaller defending force. And Ken (or Ken's wife, or whoever played the second half of his game against Bil) did a good job of showing how tanks could be impotent ( ) against sneaky infantry armed with incredibly inaccurate piats and something like 1200 mortars. My 2 ct. I would forget the objectives and try to destroy Bil's forces. To make the best from the open north of the map, I would order three of the cheapest Panther (regular, not typical!) and keep them away in the north, with oversight into the village (if the map allows that). I would also not try to hold the woods, because it can be expected he will buy lots of PPSh units. No need to face them at close range in the woods. Northeast objective: Let him come torwards north through the wood. He will be able to get to the end of the wood southern of the northeast objective. There he will already smell victory and begin to concentrate forces for the final attack on the objective. Southern of the objective I would place two TRPs in the woods - for a line barrage between the two TRPs. I'd buy 81mm mortars, two barrels, 80-100 grenades; gives two fully short+heavy barrages - this should be enough to decimate any forces ready to jump off for the final attack. The rest has to be done by two platoons. One in the objective 0or northern of the objective. And one as reserve on the far left border of the map in the woods. The task of this platoon would be to cut the attacking forces off, or at least attack into their right side. Thanks to my Panthers controlling the north, he will not be able to move tanks around the wood torwards the northeastern objective to support this attack. He can only move through the wood and then must exit the wood. Additionally also the Panthers can support the defense of the northeastern objective if really necessary. I would place my infantry not in the village, but hard at the north directly adjacent to the farthest northern houses to be covered from the back with long range fire of the Panthers and HMGs. 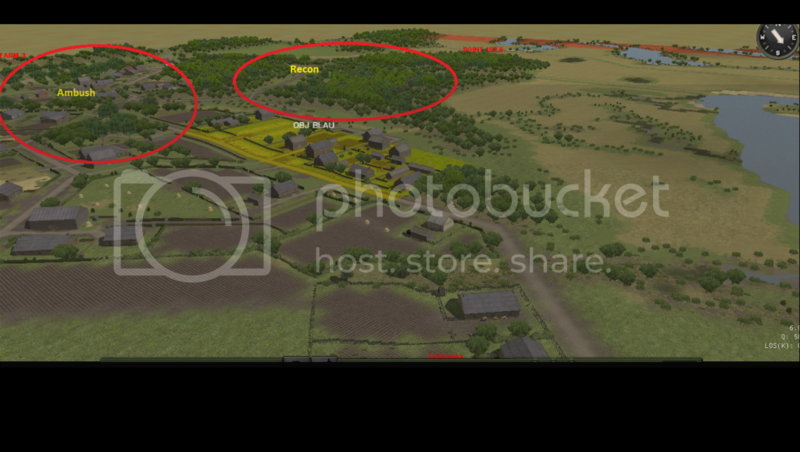 He can enter the village, but touching the northern side would expose his infantry to the long range fire. The longer he would stay there, the weaker his forces would become. I would keep the Panthers hidden and wait until he exposes some of his tanks. T34-85 I would only attack with at least two against one to be on the safe side. Until no clear picture of all his tank forces, I also would keep the Panthers closely together. One HMG for the northeastern objective, NOT in the objective, but covering the route from the wood to the objective and the objective. The best would be a position that cannot be seen from the woods, but only if the woods have been left torwards the objective. And four HMGs roughly 300-500 m northern of the village. These could also act as supressors against the tanks right before the Panthers engage a tank. 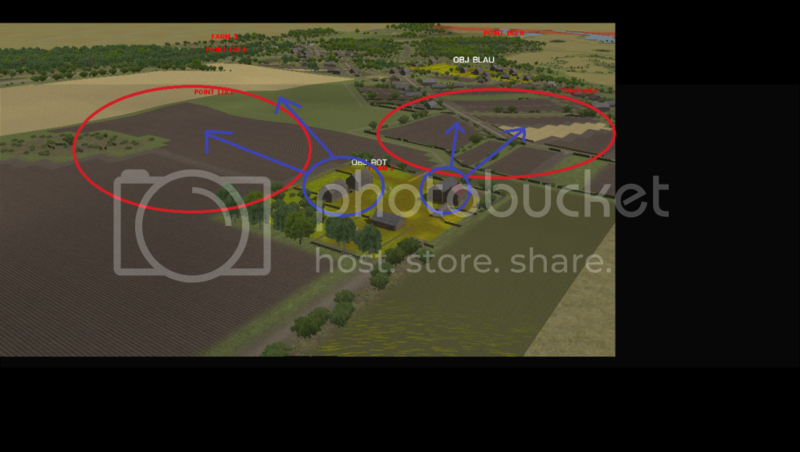 ps: since he will probably have lots of artillery, I would use one squad, splitted into three teams as forward posts, in the wood and in the village to make him believe I was sitting there. I would be loud and shoot and as soon as he recognizes me, I would sneak away hopefully making him waste his artillery on the village and in the woods. Its really hard to tell for me with the 2d Map, but Depending on how many Paths the Eastern Woods have for Armor, some Antitank Mines might really be a good Idea. Not Many, just enough to Possibly Slow and scare the Soviet Armor if it trys to enter the Woods. If he manages to get through, he probably wastes time, if he has to reposition his armor, he looses time. Win Win. I'd also really like to see at least a Hetzer and how it Performs. I really love the two FT Halftrack, but I guess if not in very dense city maps its probably not a good Idea. Thank you guys for all the input. HistoryLover, I love your ideas and will probably use a lot of them. Here are some screen shots of the map (although many of you have probable already seen Bils and are as familiar with it as me). Here's an overview of my set up area. Pretty large area. From Obj Blau I anticipate that the woods in front to the southeast he will aggressively recon. I plan to recon the area myself in short stop and go movements. I'd like to give Bil the impression that I have devoted a fair amount of forces to the area but I don't plan to. In the village area to the east I want to set up a few ambushes for infabtry and armor. During the set up phase I'll go into that more but I'm thinkiong hidden units with VERY small covered arcs. 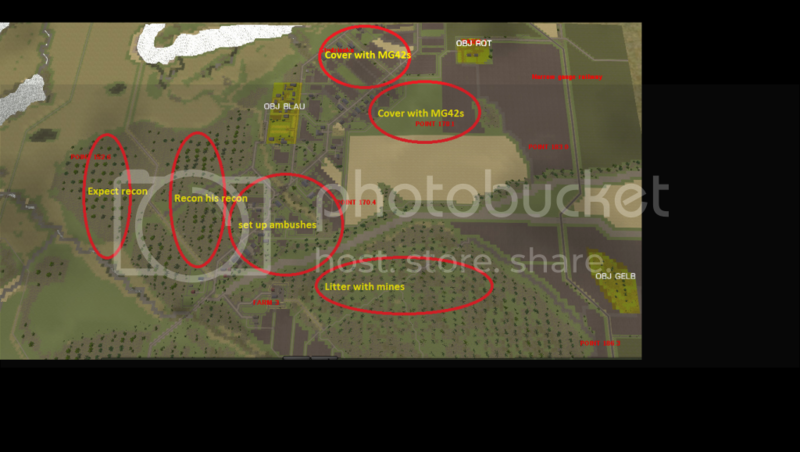 For Obj Rot, I plan to use MG42s to make the cover the open ground to the south and east. If things go as I hope it will draw his armor out to deal with them. Obj Gelb is where I believe he will try t make his way to before trying anything with Rot. I need to make this large patch of heavy trees as unwelcoming as possible. I plan to litter it with mines. Here is an overhead view with some quick notes about my loose plans and ideas. I'll go into more detail, after the force selection, during the set up phase. Just for Clarification: Do you plan to keep Obj Blau completely free of your own forces? If so, how do you plan to deal with any Armor you might draw out, especially with all the cover from houses? Just a word of caution: I did some research on the effectiveness of the ISU-152 on German big cats. They were much more effective than I had previously known. I like HistoryLover's plan, but one of the "zveroboy" (no way I spelled that right) could absolutely ruin some Panthers. I imagine even the "smaller" ones, such as the SU-100 or SU-122 could mow down pretty much anything short of a King Tiger. It might even be wise to avoid armor altogether. I'm not sure how much we should say, so I leave it at that without aproval from you to go into detail. And i want to mention, my opinion isn't realy relevant. Do what you like to do, this is your battle and AAR. i don't want that you to think you should do what I say or so. So please keep going and have fun. I agree, everything upwards from and including a T34/85 can engage a Panther very well if Spotting and Scouting is handled carefully. IS2s also are a Concern for Cats, maybe even more then ISUs cause of the better Sloping and the Possibility to exploit the Cover of Objective Blau with Turrets, and are a a little more mobile than Panthers as well. That's dangerous since I'm obviously too stupid not to confuse North and South. I appreciate the comments and I don't take any offense. Hopefully you'll feel differently after I've made my purchases and set up. 2500 points will get spread very thin on a map this size. Most of my defense will involve avoiding contact and picking my fights. I'll be walking that line between not placing myself in obvious locations and placing myself in necessary locations. Just a word of caution: I did some research on the effectiveness of the ISU-152 on German big cats. Even the HE rounds did serious damage, including cracking weld seems. It will be interesting to see how that works in-game. It probably depends very much on the personal playing style. Tanks that can penetrate my tank at the given distance, I almost never attack with one tank. And I seldom use my infantry before I have not cleared the tank threats. I'm quite patient (and at the end I usually get time problems) and have no problems to move ten minutes over the whole map if I get a "secure" shot. If the spotting behaviour has not changed completely, then no matter what Bil uses, if his tank is forced to button up first and three Panthers simultaneously attack, the chances are very high, that things will go well. Ofcourse this takes longer than the usual head to head duel, sometimes 75% of the time of a battle my infantry is only waiting, but with every strong enemy gun less, the Panthers gain overproportionally if the rest can no longer penetrate them or the oponent has so few strong guns left, that he can no longer protect all his weaker armor. I Look forward to following the fight Elvis. Good luck. I just read Bil's thread, so no more suggestions from me.